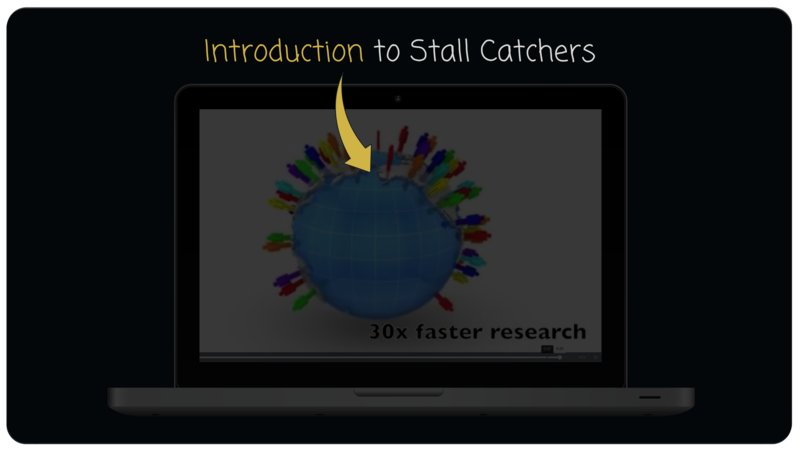 Learn more about the science of Stall Catchers on our YouTube channel & the EyesOnALZ blog. 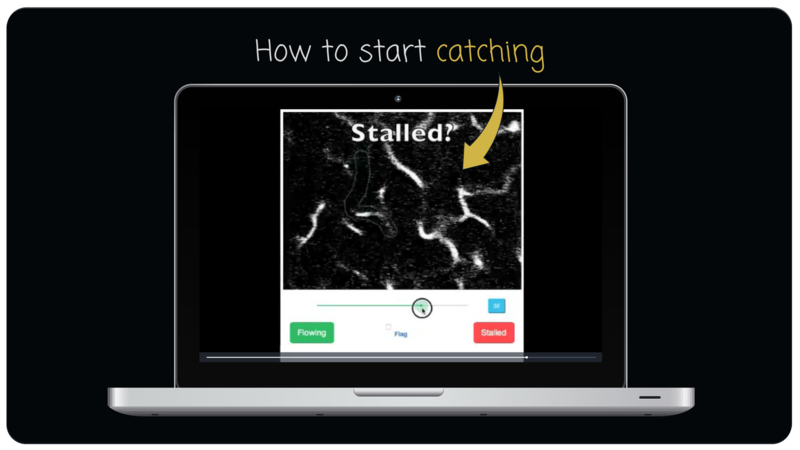 In Stall Catchers you use a Virtual Microscope (VM) to look at real movies of brain blood vessels, acquired using two-photon microscopes at Cornell University. In each movie, you analyze a single blood vessel, enclosed within an orange outline. Vessels generally appear white, since the blood plasma is stained with a white fluorescent dye. Blood cells are not stained and therefore appear as black spots inside the vessel. Under normal circumstances, black spots, i.e. blood cells, are moving freely along the length of the vessel. However, sometimes these cells get “stuck” and prevent blood from flowing. In those cases you can see a black “gap” in the vessel that does not move through the entire length of the movie. Such a vessel is considered a stall. Note that individual black spots might not be visible in all vessels. Nevertheless, if the the white blood appears flowing and no "stuck" black spots are visible, it is probably flowing. This is a magical zebra. You can tell it’s magical because it sparkles. It is also a healthy zebra, which you can tell because the stripes are moving. Only healthy zebras have moving stripes. When a "magical" zebra gets "sick", it is still sparkly, but it’s stripes get stuck and no longer move. We use these magical zebras as a metaphor for blood vessels that are either flowing or stalled. Vessels in the Stall Catchers vessel movies, like the magical zebras, are always sparkling (white dots flicker as the microscope changes focus), but the black stripes can appear either moving or stuck. When at least one "stripe" appears stuck, we call this vessel a stall. To start analyzing go straight to “Analyze” and start watching a vessel movie. You can scroll the movies yourself using the slider below the movie. To make the movies play automatically, just check the “Autoscroll” checkbox. Next, find the vessel to be analyzed. Play the movie, paying attention only to the area within the orange outline. Usually (but not always) around the middle of the movie, a white vessel will appear in the center of the enclosed area. This is your vessel. If you see more than one vessel inside the outline, pay attention to the one that most closely follows the shape of the outline. Note that as each frame corresponds to a single layer of the brain tissue, depending on each vessel’s 3D shape, only a part of it may be seen in any one frame of the movie. However, by scrolling forwards and backwards you should see how the shape of the vessel follows the centre of the orange outline. As you scroll through the movie, you may see black “spots” inside the vessel, which are either moving (change position between frames) or stuck (do not change position in multiple frames). If there is at least one black “spot” that does not change position while the vessel is visible, the vessel is stalled. When this happens, click on the “Stalled” button & then click on the black “spot” directly in the movie to annotate the vessel as stalled. If no stuck “spots” are present, the vessel is flowing. 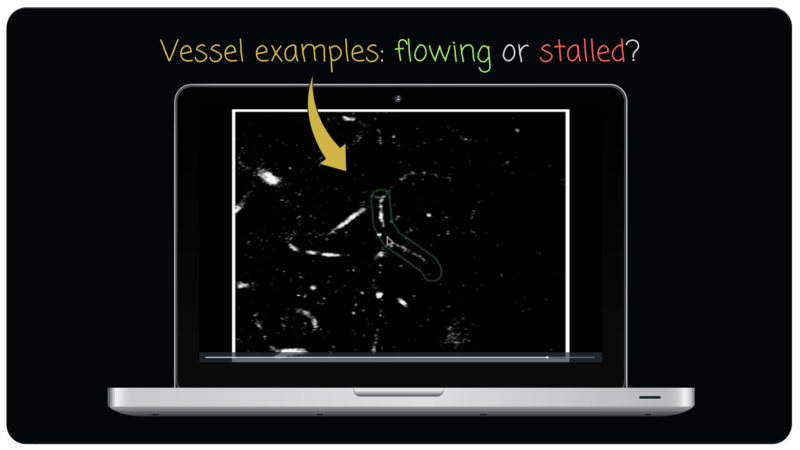 In this case, click on the “Flowing” button to annotate the vessel as flowing. Important: Make sure you look through the entire movie before making a decision! Note that in some movies individual the black “spots” are less evident, even if the vessel is flowing. That is normal and depends on the focus of the movie. What you should concentrate on is “spots” or “gaps” that are present within the vessel and don’t move. If there is at least one such “gap”, the vessel is stalled. After you have given your answer, you’ll be shown feedback. In the case of “training” movies (ones that have already been seen and annotated by researchers), you will be able to find out whether or not you are correct. In the case of “real” movies, i.e. ones representing real experimental data where we don’t know the answer yet, we will show you the community answers and comments. If any stalls have been indicated, these will be indicated with red dots directly over the stalls in the vessel movie. Feel free to add your own comments on movies in the comment box - both for “expert” and regular movies - to help out fellow catchers! You can also discuss difficulties, tips and/or suggestions you may have on our forum: http://forum.eyesonalz.com/. When you are ready to move on to the next movie, click “Next” and keep going! Do not worry about getting each answer right! Each movie will be seen by multiple participants, ensuring we arrive at the right answers together. If you prefer not to see feedback after each movie, uncheck the “Show feedback” box. There might be multiple vessels crossing the orange area during the movie. That’s normal - after all, there is a tight network of blood vessels in the brain. However, you should pay attention only to a single vessel, which follows the centre and is fully contained within the orange outlined area. In some movies, individual blood cells (black “spots”) will be more obvious than others. That’s normal. Concentrate on finding any “spots” or “gaps” that are not moving, indicating a stall. Stalls are rare. We have included a fair sample of stalled vessel in our training movies, but as new vessel data (“real” movies) comes along, only a small percentage of them will be stalls. Do not be disappointed if you don’t discover stalls in real movies for a while, and keep a keen eye out for them! 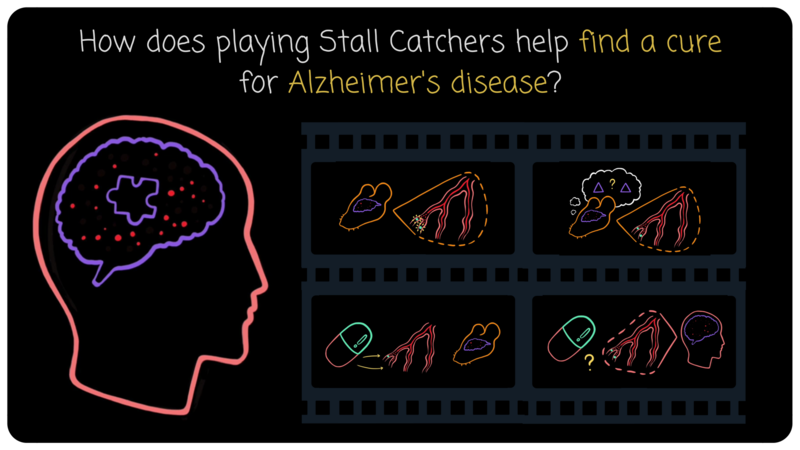 These are significant finds and the very few you discover could be carrying important clues to Alzheimer’s disease. Sometimes vessels may occur at awkward positions, such as “bumping” into the edge of the image. Nevertheless, do your best to follow the entire visible area of the vessel frame-by-frame and look for signs of stalls. Some vessel segments are so small, they might be difficult to interpret. However, always try to find a vessel fully contained within the enclosed area, however small, and look for “stuck” spots. Some movies may appear very “noisy” or “grainy”, which makes it more difficult to identify a stall. Such movies might require a more careful examination, particularly to discriminate between actual movement in the vessels and motion artifacts (“fake” motion) created by the flickering of the noise in the image. Nevertheless, concentrate on the vessel to be analysed, and look for spots that are not changing position across layers.